Jo's Vignarola "Pilgrimage of Posh"
Another wonderful recipe from the very talented Jo Wennerholm of Frascati Cooking That's Amore and of course partner here at Giardini di Sole & Flowstone Design. The fresh bright green colors of this dish make it the perfect springtime recipe. The venerable Italian vegetable stew known as Vignarola, simple ingredients, very grand finale. The making of a Vignarola is a kind of culinary pilgrimage, it must adhere to season and month when these vegetables pop up all together – April. In today’s recipe I went to the added trouble of removing the outer sheath of the broad beans, an exercise in ‘poshifying’ the dish as it were, hence the title. I have tried to present the recipe to make it as time-friendly as possible. • two artichokes, preferably the Roman kind that are at their prime in this season (Spring). Let’s take a look at the ingredients. I have placed them on the same plate so that you can get an idea of the proportions Roughly speaking, one needs the same amount of all the vegetables. Located at the top of the above photo is the guanciale, the pork jowl. In the middle of the photo is a ceramic decorative object known as a ‘pumo’. It comes from Puglia and it is symbolic of good luck and the augury of all good things to come. I stuck it in the middle of the plates because I associate the color green with Spring and with the making of the Vignarola. It is traditional to also add mint to the Vignarola stew … here is some ordinary mint & ‘mentuccia romana’ or Pennyroyal in English, from plants on my balcony. I used then both, you can choose what you have available. 1. Thickly slice the guanciale into a matchstick shape. 2. Roughly chop the spring onions. 3. 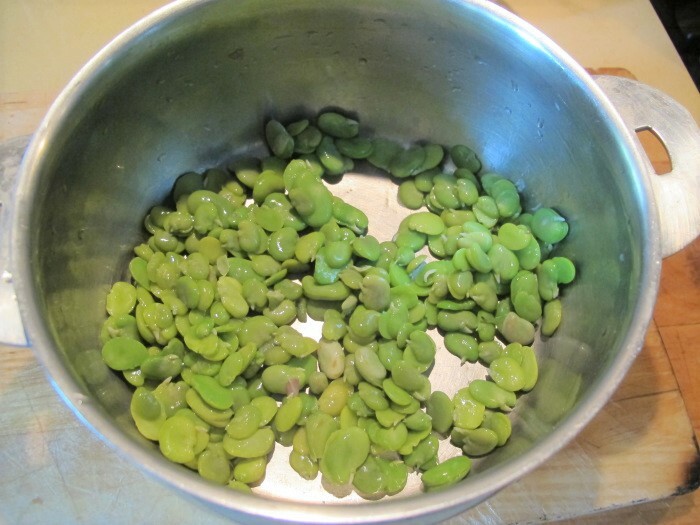 Bring a pan of water to the boil and add the broadbeans. 4. 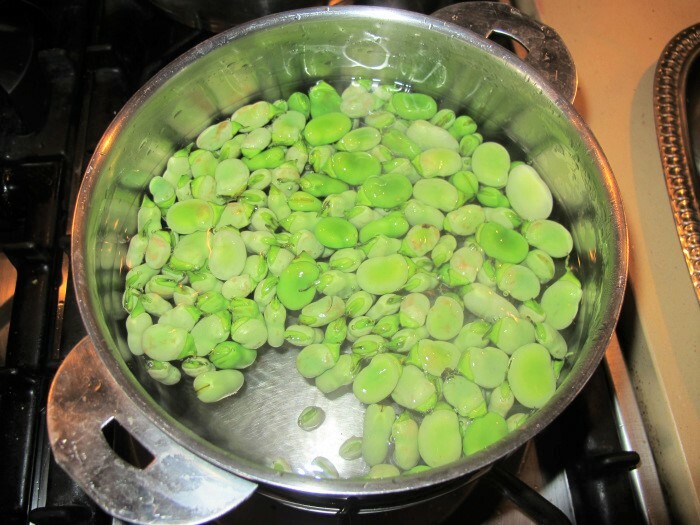 Simmer the broadbeans for about 2 minutes, drain and place in a bowl of iced or at least very cold water to cool them down. Then arm yourself with a good deal of patience … or better still, find someone else to step in and help you … and get on with the job of removing the skin of the broadbeans. One by one … Oh yes … it takes ages. Dribble a generous amount of olive oil into a frying pan. Here, I put six pepper corns into the pan. You may wish to avoid them altogether – you decide. Turn on the heat, and put the peas in the pan. Add one teaspoon of sugar. Add one teaspoon of salt over the sugar. 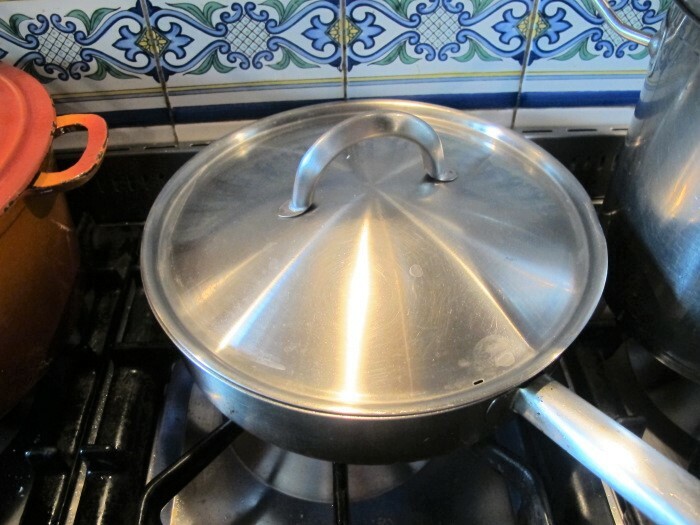 Pour boiling water into the pan. Plenty of it … enough to cover the peas by 2 cm (an inch or so). Simmer until the peas are tender. It took the better part of 20 minutes to cook these. Peas done. Turn off heat, set aside. 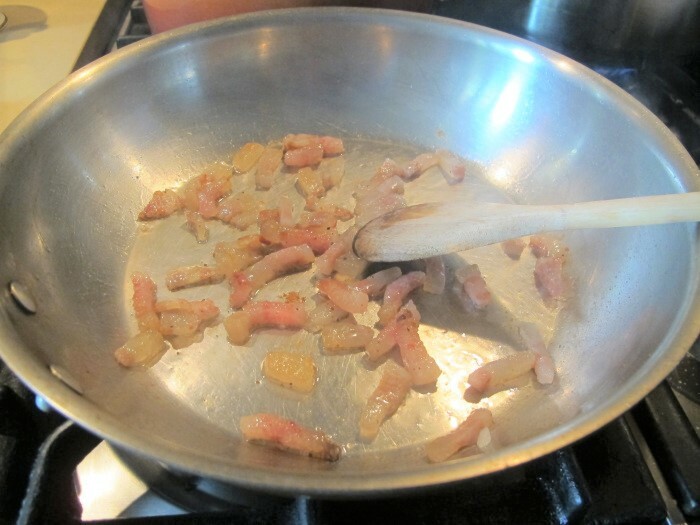 Use another frying pan to render the fat of the guanciale over a medium heat. This takes about 2-3 minutes. Once the guanciale has crispened up a bit, add some olive oil. Now add the spring onions. Cook for only a couple of minutes. Now add the artichokes. Cook for about 2-3 minutes. Remember the peas? See how much cooking water there was? A kind of pea"soup"? 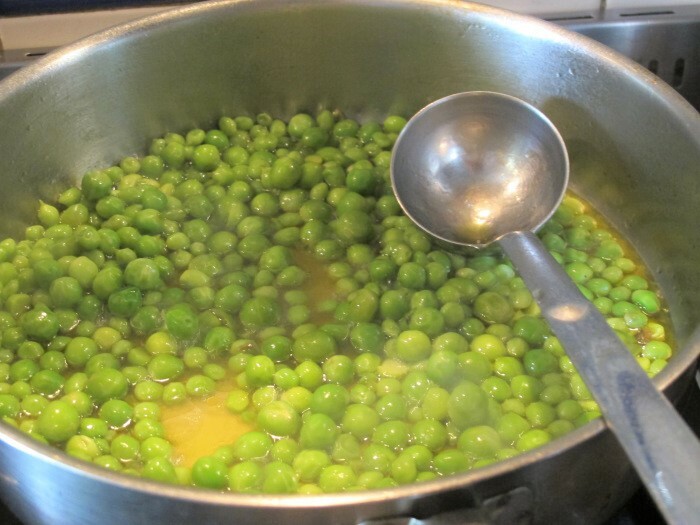 Pour some of the pea soup using a sieve into the frying pan. Keep cooking … the artichokes will need this liquid to become tender. Keep the flame quite high. Keep adding the pea soup, as required. When the artichokes are tender, push a fork through one of them to find out when (about 10 minutes), add the cooked peas. Put the lettuce where the peas had been, notice I used up all the pea soup except for a tiny amount. Cover with a lid and cook for about 1 minute. 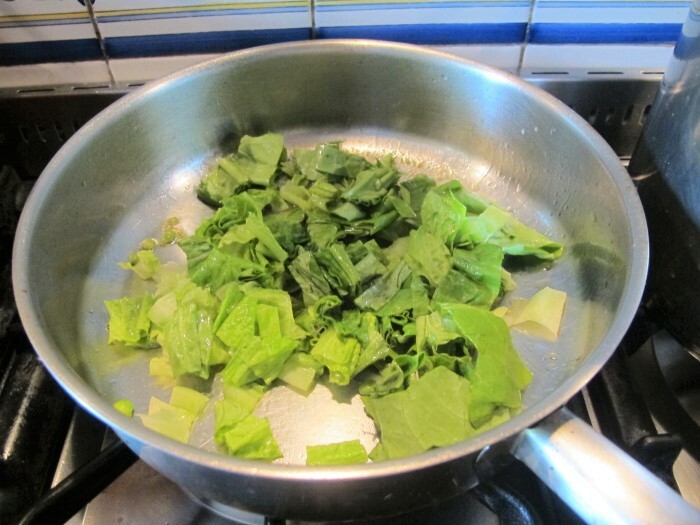 Remove lid and add them to the big saucepan with the artichokes and peas. Add the broadbeans to the big saucepan and use a wooden spoon to gently combine all the ingredients, cooking them for another couple of minutes. Add the mint and then swirl some more olive oil over the Vignarola. It is now ready to be served.